Mashed chickpeas create a texture very similar to flaked chicken and the sauce gets a boost from a creamy eggless mayonnaise. I’ve also added a hefty amount of crunchy vegetables like celery, green onion, pickles, and bell peppers to give it a great crunch and loads of fibre. Serve this salad in pieces of Boston or Bibb lettuce, in a wrap or sandwich, or on crackers. If you have a picnic or road trip in store you’ll be happy to know that it packs well. Recipe is lightly adapted from The Oh She Glows Cookbook. In a large bowl, mash the chickpeas with a potato masher until flaked in texture. Stir in the celery, green onions, pickles, bell peppers, mayonnaise, and garlic until combined. Now, stir in the mustard and dill, and season with the lemon juice, salt, and pepper, adjusting the quantities to taste. Serve with toasted bread, on crackers, wraps, or on top of a basic leafy green salad. Or just enjoy it all on its own! If you’d like a soy-free version of this salad, be sure to use soy-free vegan mayonnaise. Veganaise makes a great soy-free version. I make this recipe so often, I figure I should really comment on it! I eat it in a sandwich, on top of a salad, and even with crackers. I’ve found it very forgiving when I don’t have all the ingredients–it always turns out yummy! I also minced all of my peppers, celery, and onion into the smallest pieces ever. This recipe is the best when refrigerated overnight so the flavours meld. This is so easy to and healthier too! Thanks a lot for sharing this recipe. Proud of presenting these sandwiches to a gathering !! This is our absolute favorite sandwich!! It’s so delicious with toasted multigrain bread and spring greens. All of our non-vegan friends request it as well, and if we bring it to a party, we serve it with crackers or on mini hawaiian bread rolls! Yum!! Used celery, scallions, carrot, and some chopped cucumber that I quickly pickled in Bragg’s apple cider vinegar. Plus the garlic, vegenaise, lemon, and s&p. It’s SO good! Just made tonight, and only had dijon – turned out amazing! thank you for sharing! I am not vegan but prefer this salad over any chicken or egg salad recipe. It has the perfect taste and texture and asana have commented, can be enjoyed in so many ways. Thank you Angela for this deeeeelicious addition to my go-to recipe collection! I’m with you, not vegan or vegetarian, but this is the bomb! finally made it yesterday for the first time and will definitely be a staple for me! I absolutely love this recipe. I added diced carrots and dijon mustard as well as the fresh dill so there was an extra crunch and more of a kick to it. Served it on olive oil drizzled toasted bread, topped with baby kale and spinach. Perfect post gym meal/snack as it’s so high in protein and filling. This is a great, tasty and filling recipe which my family makes week in and week out. Its great alone, as a late night snack, stuffed in pita or curled up in a wrap. Bravo! Just made it. Great recipe! This recipe was soooo delicious! I did sub with Basil and instead of mayo, used Greek yogurt instead. Also, didn’t have a red pepper, so used tomatoes. Delicious! Made two batches- one with celery, and one without. Both were so satisfying. Thank you! Amazing!! Before I stopped eating meat I never cared for chicken salad, but this recipe is so good I keep making it all the time. Everyone, meat eaters included, seems to enjoy it as well. Om nom nom. Approved by the husband all 3 kids, so this stuff is magic! I told them to try a new recipe for chicky salad so they would give it a try and they loved it. My 3 year old calls it Chicken Bawk Bawk so now Chicken Bawk Bawk sandwiches are a favorite at our house. Thanks for the recipe! That is such a cute name!! We loved it! The supermarket dill wasn’t looking too hot so we skipped that ingredient. It was still delicious. New to plant based diet and was looking for something fairly quick to make for lunch. I didn’t have all the ingredients so just used what was in my crisper and it still turned out great! I added a very ripe avocado that blended nicely with the mashed chick peas, cherry tomatoes and green onions. I didn’t have any dill so I used up the last of my relish and mustard, fresh basil, a wee bit of minced banana pepper from my garden, and garlic powder. Yummy! For me, I think this will be one of those recipes that will never be the same twice as I will always just add whatever is on hand but this is a fantastic base recipe that anyone can expand on. What a delicious recipe! Loved the flavors & how filling it was! Thank you! 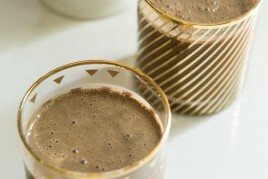 This recipe is super yummy and lends itself very well to substitutions. We make it religiously ever since getting the cook book. Perfect for picky eaters, big and small. Sometimes I put in a little bit of powdered nori and a dash of old bay for a tuna-like flavor that the kids like better than tuna salad, even though they are not vegan. Winner, winner, not a chicken dinner! OMG, i just made this! Where has it been all my life?! I’m not vegan but always looking for a healthy alternative as I am pregnant and wanted to incorporate more healthy things into my diet. I will make this again and again. Thanks! I just made this and added some Goya Adobo. PHENOMENAL!!!!!!!! I’m letting it sit I the fridge for a bit. Can’t wait to taste it after all of the flavors mix! Hi Angel. I Made this for lunch. So good. Two recipes tried and both are keepers. Problem I am seeing with your recipes is portion control. I sooo want another sandwich. This is a great substitute for potato salad too! Thanks for sharing it…it will be my lunch today! I think it is better with cannelini beans! YUM! Just made it, and agree that this is a great base recipe to sub in whatever is around. (I used carrots instead of bell peppers, shallots instead of green onions, etc.) Will be making this one again and again. SO good. Thank you Angela! I bought the Oh She Glows cookbook (and Thug Kitchen) a week ago to give to my daughter who recently decided to try eat Vegan because I wanted to support her decision and I also wanted to be able to make Vegan meals when she visits. I gave her the Thug Kitchen first and decided to keep the Oh She Glows for myself to try for a while. The Chickpea Salad is the first recipe I tried. I LOVE LOVE LOVE it! THEN, I made the Yolos. They are awesome TOO! I’m going to have to get another copy for her because I am keeping this one. I just can’t wait to try ALL the recipes. Great idea! My Veginaise is getting old and was looking for a substitute. I’m going to try mashing avocado with lemon juice and salt to help reduce the avocados browning oxidation as we won’t be eating it right away. Also it will hopefully give it similar zing as mayonnaise. Clearly I have been missing something good here. I love chickpeas and am always seeking a sandwich that won’t get soggy, but that has some zing in it! Now, I must try this. I avoid bread but I can see this inside an avocado calling my name. Off to try something gorgeously new. Amazing! A go-to winner, that will be made again and again. Don’t omit the dill – that is the touch of perfection to this very good salad! Another brilliant recipe from Angela, thank you. I used to eat tuna salad daily, and this one hits all the flavor and texture bases so well, and loses nothing (except the heavy metals!). If you’re in the mood for a tuna/chicken salad, make this recipe, you will love it. My only alteration was a bit of de-seeded jalapeño pepper, for a wee bit of spice. I’ve had it twice in three days! Delicious, I doubled the recipe to take to a family picnic. I hope I have leftovers! I made this last night….it was SOO amazing!! All the recipes that I’ve made from your cookbook have been a hit but this was is my favourite! Fantastic! We double the recipe and refrigerate weekly. Makes a great sandwich! I have non-vegan friends that have outright abandoned their tuna fish and chicken salad recipes in favor of this tasty creation. I absolutely love love love this recipe! I put it all in my food processor and used slightly different ingredients like jarred roasted red peppers, a sliver of red onion instead of green and Dijon mustard. This will be a frequent lunch from now on. Thank you so much for this creation! Thank you! I was out of garlic and pickles and it was still delish! Can’t wait to try them again with all the ingredients. I am allergic to onions. I can eat dried minced onion and onion powder but not the real thing. Any suggestions as a substitute? I find that the vegetarian recipes that call for real onion are sometimes lacking in taste. Would you have any recipes for home-made vegan mayo? I don’t eat processed food so veganaise is out… I know some people have suggested avo/guacamole, but I think this might be little heavy? I would love a healthy home-mado mayo recipe if you have one!! Thanks! I have a vegan Mayo in my first cookbook. I make it Waldorf style with celery, apple and walnuts. I’ve made this recipe a number of times and just love it. We eat it in tortilla or lettuce wraps, on a sandwich, or sometimes just as-is (as a salad). It’s perfect for summer potlucks or to bring to lunch at the beach or in the park. It keeps very well in the fridge for a few days, it’s definitely a staple for us! loved it and super easy! So good! I was surprised how filling this was. Thanks so much. Perfect lunch. Just tried this today. Didn’t have any dill so I did without but no complaints here!! Loved it!! So good!!! When I used to make tuna sandwiches I would use mashed avocado instead of mayo. Do you think swapping mayo for avo here would work here as well? This was the best sandwich EVER!! Thanks for the recipe! I made this today and ate half of it for lunch. I LOVE this recipe! 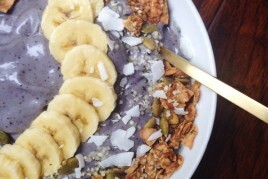 I gave a spoonful to my husband (who eats meat as well as everything vegan I make!) and he loved it too. I am working on him to try going vegan for a month, some month of his choosing. Tried this as a taco filling with sliced avocado. So delicious! Hubby and I are in love with this recipe. Thank you sooo much for sharing it. I am a big tuna sandwich fan and now that I’m pregnant tuna is off limits… but this fulfills the craving and is much tastier. Keep ’em coming! Made this yesterday…..I was light on a few ingredients but as others commented, its a forgiving recipe and will take what’s offered (lol). I forgot the garlic and will use it next time. I have a feeling I will be making this weekly. I had it on a few crackers and also on bread and will try lettuce wraps. Great recipe! Forgot to add the pickles and still tasted fantastic! Reminds me a little of an egg or tuna sandwich. Thanks so much for sharing! Amazing!!! This recipe gets a lot of use. Makes a great lunch. Hi Angela! This is my absolute favorite recipes from your cookbook! I always make a double batch because everyone in the family loves it! For a double batch I love to add 1 diced apple, a few handfuls of shredded carrot, 1/4c dried cherries, and I increase the dill to 1/2 cup. I also use a microplane to grate the garlic so it melds nicely into the salad. That sounds amazing!!! Can’t wait to try this. Sounds a bit like a Waldorf salad? I forgot to mention, because of the increased ingredients, I add an extra tablespoon of mustard and mayonnaise for a double batch. Its amazing stuffed into fluffy whole wheat pita bread. Delicious. I really loved the flavor and the texture of this salad – a perfect lunch option in a pita or wrap. Thanks for the recipe!! Just made this and devoured it on some lettuce leaves-as-bread! Sooooo good!! Added some old bay seasoning for a more seafoody taste! Angela, When your recipe calls for “yellow mustard” are you referring to a spice or actual mustard in a jar? Hi Karen, I’m referring to the actual mustard in a jar. :) Sorry for any confusion! A wee too much celery in this recipe for mua but it’s easy to adjust to personal preference. Thanks Angela! I literally make a double batch of this at least every two weeks, if not every week. I typically eat it in a pumperknickel or sourdough wrap… that is, if I can stop myself from eating it straight from the bowl! I had everything but the celery, and this turned out so deliciously! I’m always on the lookout for easy recipes and this was quick and tasty. Could you post more often on facebook please? I would love to see more. Thank you. I just made this for the first time and it has rocked my world. I’m already obsessed. So healthy, flavorful and full of satisfying crunch! I forgot the lemon and left out the garlic since I only like garlic cooked. It was amazing!! I have your cookbook and have been a fan of your blog for a while. Every single recipe of yours I have tried has been top notch, but this one is my new favorite. Keep doing what you’re doing! This really deserves more than 5 stars. How about 100? This recipe is amazingly quick, easy, and tasty. And it keeps really well, so I’m always making it for daytrips/roadtrips. All the non-vegetarians who I’ve shared it with are also fans! Wow! This one has become a weekly staple for me. I absolutely love it. I usually add a jalapeño pepper for crunchy spice. Great for lunch on the go. I’ve made your flaked “tuna” salad before and it was very tasty but I wanted something a little closer to real chicken salad (I am newly vegan so there are still times when I crave meat). This recipe is amazing and made me forget about chicken! I made myself a chickpea salad wrap for work today, topped with spinach, cucumber and tomato, and I cannot wait to eat it. I love your website. Thank you! I love this one! So delicious! This is my go-to lunch recipe! Often I’ll be lazy and omit the celery and red pepper, and it’s still just as delicious! oh. my. GOODNESS. this is my first recipe that I tried of yours and my mind is blown. WHO KNEW THAT MASHED CHICKPEAS COULD BE THIS AMAZING?! I mean honestly. I was cutting up the dill pickle like… oh my god… what on earth is this woman making me do… but I literally had to force myself to stop picking at it because it was so dang delicious! I like sweet and savory salads, so I did add a little chopped gala apple too, which is great, but definitely not necessary for this recipe to be off the chain. I’m literally going to be stuffing it into any and everyone’s mouth all week. ugh. SO GOOD! I can’t wait to try more of your recipes!! OMG I was wondering what to take for lunch on an all day Easter egg hunt and this will be a perfect sandwich! Thank u for a lovely book I am loving all your recipes! So happy to hear that, Dana! I hope the Easter egg hunt is a blast. This was AMAZING!!! I am a new vegan and have been having trouble finding recipes I like. This was soooooo good. Even my meat loving husband liked it. I ran out and got your cookbook after making this. Thank you for your great recipe. I am looking forward to more winners. That’s awesome, Amber! I’m so so pleased you enjoyed the recipe. I hope you love whatever you decide to try next just as much! I just made this for the first time and it was amazing! I use dried dill instead of fresh and it worked well. I was pleasantly surprised at how good this was, and it curbed my craving for an egg or tuna salad sandwich. I put lettuce and tomato on the sandwich as well. Loved it! I’m glad to hear you enjoyed it, Amanda! Delicious recipe- this is my favorite of all the chick salads we’ve tried. I love it on toast with avocado and sweet potato fries. Thanks! I LOVED this recipe! Perfect for a sandwich, I use Ezekiel bread and throw on some arugula. I didn’t have vegan mayo and didn’t have time to make so I substituted tahini. Still delish. This is delicious! I am an athlete, and somewhat conscious of my macros (particularly protein), so while making this, I did it in “waves.” I portioned out 3/4 cup of the chickpeas, mashed them, added half of the above veggies, mayo, mustard, dill, etc., then did it again with another 3/4 cup chickpeas, adding the other half of the ingredients. This yields ~10g of protein per salad. I had it “open face” style on a single piece of sprouted grain bread, totaling 14g of protein for lunch. This would be great to travel with, too–I always pack a small cooler of snacks when on the road (which I will be this weekend). So happy I found Oh She Glows! I think something went wrong! I just made this recipe, and it all tastes great, but my chickpeas were weirdly dry. I didn’t have a potato masher, so I just used a fork, and I also put them in the microwave to make it a bit easier. After tasting it, I was really surprised at the texture of the chickpeas. I added some olive oil, and it helped a little bit but not much. I really want this recipe to work out, and I’m open to trying it again if someone gives me some tips! Hey Anna, I’m happy to help! You are right that when you first mash the chickpeas, they will be quite flakey and dry in appearance, however once the mix-ins are added (especially the mayo! ), it turns into a well-dressed salad with lots of moisture from the dressing. It sounds like microwaving the chickpeas probably resulted in them getting even more dry, and then things went awry from there. My advice is to try the recipe again and see what you think! It’s one of the most popular on the blog (and a personal favourite of my own) so I hope it works out for you! Thanks for your feedback, and please let us know what you think. This is the first time I have ever commented on a recipe, I really feel the need to since this was so amazing! The recipe is so delicious and you can even customize it easily by adding veggies you have on hand. I think this is going to taste even better tomorrow as leftovers! I used Just Mayo instead of veganaise and this was the best! I went vegan earlier this year and really missed sandwiches. I made this with toasted Dave’s Killer Bread and it is now my favorite meal! This will be perfect for picnica this summer too! Another great recipe! I used regular mayonaise since I couldn’t find vegan, and I skipped the dill and red pepper. (I’m not a big dill fan and I had no red pepper). It was DELISH!! So glad you liked it, Christine! I am not a big chickpea fan. I’ve tried making chickpea salad with just vegan mayo and some old bay seasoning but it just wasn’t cutting it. I found this recipe and was a bit skeptical but figured I’d give it a try. I didn’t have pickles (I don’t like them) or peppers so it was a bit more bland than intended but I LOVED it! I brought it into work and all of my omni coworkers loved it as well! I love sharing vegan recipes with people. Thanks so much! I’m so glad it was a hit, Kelsey! :) Thanks for spreading the recipe love (and newfound chickpea love, hah), too. Could there be a curry version of this salad? Anyone ever try? Fantastic salad!!! I made this chickpea salad with a curry twist. It was wonderful and will definitely make it again. I don’t care for pickles or dill but love curry. I omitted the pickles, dill, and mustard. I used plain greek yogurt in place of the mustard and seasoned with 3/4 to 1 teaspoon of lemon curry. I also used 2 1/2 to 3 teaspoons of lemon juice. I mixed the mayo, yogurt, lemon juice, curry, salt, and pepper in a small dish to make the dressing before pouring over and folding in to the chickpeas and veggies. I served this on a wheat pita flatbread with baby arugula for added peppery crunch. I think fresh tomatoes would also be wonderful. * instead of pecans, add gently soaked sunflower seeds. I added about a half cup to the full recipe. This adds some crunchiness without detracting from the overall flavor. I loved this recipe. I went heavier on the dill pickle relish, mustard, and lemon juice. Rather than a chicken salad taste, it seemed more egg saladish to me. Either way, it was fabulous. I love my dill pickles, so the relish really set this apart for me. Definitely a keeper! I love this salad! I doubled the recipe and left out the celery. I also put the onions, pickles, and pepper in a blender with the garlic before I added it to the mix. (I like the veggies chopped fine.) So delicious! Thanks! I have never been a fan of sandwiches, or even wraps for that matter,because I have the misfortune of having to be gluten free. Let me tell you, there are not many gluten free breads or wraps worth eating out there, and I don’t like how messy lettuce wraps can be, but when I read this recipe I knew I had to try it. Well I can honestly say, this recipe is well worth spending the money on gluten free wraps. I have NEVER enjoyed a wrap as much in my life. The flavour combinations are so fantastic, they actually covered up the taste of the wrap itself. LOL! Thank you so much for sharing this recipe. I am so looking forward to your second cookbook. I am looking forward to eating this for lunch often! Hi Helen, thank you so much for this awesome comment! I’m grinning ear to ear. It’s great to hear you enjoyed the chickpea salad so much–it’s definitely a favourite around here, too. And I hope you absolutely love the second cookbook when it comes out! What a delicious recipe, thank you!! Most people where I am from (small town Kentucky) have never heard of or don’t believe in being vegan. This is the recipe that could convince ANYONE that they don’t need meat to make something delicious. This recipe was truly better than any chicken or tuna salad I have ever had. This recipe is just amazing and I can’t wait to make it for more people. Mmmmm. This is outstanding! Reminds me of the brown bag egg salad lunches my mom used to pack for me on special occasions in elementary school. I actually prefer the chickpeas to eggs! Thank you for sharing : ) PS Slightly overcooking the chickpeas ensures they are not rock hard. Scarcely any mashing required. Easy and delicious! Tastes a lot like potato salad without the guilt. My new favorite vegan/ gluten free recipe! Hi, I’ve seen this recipe for a while and didn’t make it because it is SO not my kind of thing. HOWEVER! I finally caved and made it, thinking, what the heck. OMG!! I am now on my second batch within a week! It is so delicious and refreshing and per another person who commented, I used Dave’s Killer Bread that I picked up at Costco on the weekend. I’m totally hooked and I’ll be making it over and over and over. Oh, and per yet another person’s comment, DO NOT leave out the dill; it’s subtle, but you do get a hint of it. Amazing, thank you!! Hey Rose, I’m so glad you enjoyed the recipe so much!! It’s one of our faves. Holy addiction. Best tecture. Best taste. Suuuuper easy! Love this recipe and everything she makes! LOVE this recipe. Perfect for a grab-n-go lunch. I make it on the regular in sandwiches (I use Ezekiel bred and lettuce) or sometimes I use lettuce wraps. I make this salad on a periodic basis for lunch and it’s a delicious filling vegetable packed lunch. I usually don’t eat it with lettuce cups or bread. I reduce the mayo to 1 or 2 Tablespoons and it’s still fantastic. This is the first recipe from OSG I’ve tried (I know, where have I been all this time?) and it’s super! I’m not much of a cook so I really appreciate recipes that are extremely easy to make, and this one goes right up there at the top of the list of 15-minute meals I can make. I made this for me and my boyfriend last night. He’s not a fan of salads and is diehard meat-eater all the way. This is the first time he didn’t shake his head at a dish of veggies, so I can say that’s really something. Thanks for this Angela! I’m browsing through your site right now looking for other recipes I can try tonight. My eye got caught by that sumptuous-looking vanilla bean matcha latte, so I’ll let you know how it goes! OMG!! I’m trying to talk myself out of eating the other half of this salad but even if I lose my willpower and go for it….it’s so healthy and good that it’s a win no matter what. Reminded me of an egg salad so I see this appealing to most taste people. I’m planning snacks for a camping trip with a large group of people and trying to have some healthier choices as usually everyone is sharing snacks and appetizers that taste wonderful but often full of carbs and empty calories. So much temptation that it’s hard to say no (maybe it’s just me lol). I can’t wait to whip this up and serve with some veggie sticks and crostini bread. Once again Angela, your recipes always amaze me. We are a house full of meat eaters but thanks to you, we are making room for other protein choices and increasing our vegetable intake.On a side note I just picked up some brown rice syrup so I make the glow bars to bring also. I’m so glad you enjoyed the chickpea salad, Tammy! I hope you have a great time on the camping trip (and that you enjoy those glo bars, too!). This recipe is SO good! I’ve been a vegetarian for a while; trying to ease my way into veganism. Chicken salad is definitely something I used to love- and I’m so happy to have this alternative! It tastes even better than chicken salad in my opinion. 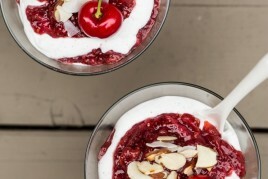 :) thanks Angela for making recipes like this to make it fun to explore vegan cooking. I just made this last night and is SOOOOOOO good. I will definitely be making it regularly. Thank you! I am heading on a Long road trip this week and plan to make a batch of this to put in my ice chest. Sounds like the perfect picnic stop food for me! So excited to have found this recipe. Thank you. Hope you enjoy it, Ruth! Oh, I bet the cilantro added a great twist! Thanks for your support, Carmella! I’ve tried it with one can of chickpeas. I used more lemon juice and a bit more mayo. This is my first Oh She Glows recipe… really easy and delicious. I can’t wait to make the next recipe… Thank you! Glad you enjoyed it, Sarah! Do you know what you’ll try next? Whatever it is, I hope you enjoy it! I’ve been a vegan for 5 years and have owned OSG for awhile. I’ve previously stumbled upon this recipe, but never made it until now. I found myself with extra chickpeas and decided to use to make this sandwich. AMAZING! It will definitely become a staple in my home. Easy, tasty and as many reviewers have noted, very conducive to substitutions. I followed the recipe to a T but for the addition of pickled turnips which added a nice additional crunch. I made it in advance and refrigerated it to allow the flavors to meld. I love it so much I immediately began soaking another 2 c of dried chickpeas for tomorrows lunch! So glad it was such a hit, Charlene! We love it around here, too. Those pickled turnips sound like a great twist! Hi Kristina, I haven’t tried anything myself, but I would suggest unsweetened yogurt. There’s also a super easy recipe for homemade vegan mayo (using chickpea brine) on the blog! Hi Kristina, just thought I’d let you know that I make mine with Greek yogurt and it’s delicious. It’s a bit tangier than the mayo, so you might want to adjust the amount of lemon juice you use. I personally don’t, I use the full amount, but i like a distinct tang. Just taste as you go – good luck! This recipe is an absolute knock-out! Even the people in my family who think veganism is crazy, DEVOURED it…I didn’t have the heart to ruin the moment :) I highly recommend this recipe to anyone! I have this weekly for lunch as I always have these ingredients on hand. Living in hot humid Queensland Australia, it’s great lunch food as it’s always crisp and refreshing. I always look forward to this for lunch! I LOOOOOOOOOVE this recipe but have been making it pretty consistently over the past two months….do you think it would be weird to sub in black beans instead of the chickpeas? I mostly see black beans used in mexican recipes and nothing that is similar to the “creamy” recipe like this. I guess it won’t hurt to try it lol. Hey Kelly, Oh that’s a fun idea! I haven’t tried that before, but now I’m trying to picture the flavours in my head, lol. Please report back if you try it out! You might even be able to add some spices like cumin, chill powder, etc. I made this today and it was SO delicious! My kids loved it too! So nice to have an easy, vegan lunch idea that the kids can bring to school too! I’m happy it’s a hit with both you and the little one, Leah! My meat eating family members enjoy this recipie, and this is my boyfriend’s favorite recipie I put together! Thank you Angela! Thanks for the lovely comment, Nancy! So happy to hear it’s a winner. This is such an amazing recipe. 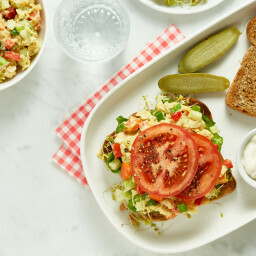 I had a chickpea salad sandwich from my local coffee shop and was immediately hooked, so I’ve been scouring the internet for a recipe that comes close. This one takes the cake! An amazing staple to have for lunchtime. I’m in high school, and I make this so often for lunch! It’s amazing on sandwiches, crackers, salads, or even just on its own. Even my (non-vegan) mom loves it! I’d highly recommend this recipe for anybody. My daughter made this for dinner last night! Sooo good! Super heathy and very filling! Thanks beans! So, so good. You won’t want to share. In love with this recipe! This versatile salad has become a regular at our house. It’s one of those you can change up the ingredients to change the flavor. My non-vegan BF loves taking this to work for lunch. I have a friend that just had a baby and wanted to drop this off with some pita pockets for a quick easy lunch. Do you think the chick peas are okay for breastfeeding or will it upset the baby’s tummy? Hey April, That’s such a sweet idea! It really depends on the baby whether he or she will be bothered by the beans. My two always seemed to be (but then again, it could’ve been due to other factors, too!). Your friend could always try it out and see how it goes, or you could swap the chickpeas for more veggies…or healthy seeds like roasted pepita seeds + hemp hearts? My favorite recipe from here! So easy and so delicious! Thank you for this amazing recipe. Being from Phoenix I had to add a little southwest “flava”, so I added jalapeños and cilantro and a pinch of Cumin. I was missing the ocean flavor that tuna has,(I was thinking Baja Mexico) so when I assembled the sandwich I added several sheets of Trader Joes roasted seaweed. Wow, that adds some minerals and that seafood taste while still staying plant based. Enjoyed every morsel. Thanks again! Your website is not working for printing the actual recipe on your site. When I click on the print icon next to the recipe it takes me to a blank page with a few headers on the left and no way of printing the recipe. I love the chickpea salad! Thanks for the great recipes! How long can this stay stored in the refrigerator for? Hi Dee, It should keep in an airtight container in the fridge for 3 to 4 days. Hope this helps! Hi Lisa, Not an odd question at all! I personally find that the mustard just adds a nice, subtle ‘tang’ to the chickpea salad, but that the salad doesn’t taste OF mustard. The mustard just adds another flavour dimension to it. If you’re still concerned, though, feel free to reduce the amount you use, or omit altogether! Thanks so much, I’ll give it a try. I just made this today, and it’s amazing! I just became a vegan recently (because of major food allergies), and I’m so impressed with the flavor in this. Lots of chickpea recipes are meh, but this one is delicious. Searching now for something for dinner. Thank you! I’m glad to hear you enjoyed it, Mari! If you try another recipe of mine soon, I hope it’s an equally big hit. I’ve been making this salad for a few years. i never get tired of it! This recipe is amazing! Love it on top of sweet potato toast!!! I love this recipe & I cannot wait for lunch tomorrow!! This is amazing ! So fresh and delicious tasting . My kiddos love it . Please add me to your mailing list. Love your recipes! I really enjoyed this recipe. I’ve made it three times. I tweaked it some and used a dill relish vs. dill pickles and green vs. red peppers. The next time I make it I’ll use some red or white onions. Thanks for posting this tasty yet healthy vegan recipe. Cindy, I love the idea of using a dill relish…fantastic idea. I’ll have to try that. Glad it was a hit! After being vegetarian for a number of years, one of the things I miss was tuna salad. When I came home this winter for the holidays, my mom kept trying to convince me to eat her tuna salad. To combat the urge, I made her this recipe. It tastes SO good! I omitted the bell peppers just because I didn’t have any. I love having this in a toasted sandwich. Thanks! Hey Nina, Fantastic news!! Don’t you love when you find something to replace an old fave? I adore this with toasted bread too..it’s just something else! I tried this recipe for the first time and absolutely loved it! I was trying to find something to serve for our holiday guest that are vegan. This recipe certainly worked and everyone loved it. I added 1/4 tsp of cumin and 1 Tsp. of parsley flakes. Did not have red peppers so eliminated that, but added fresh garlic chives and used red onion vs. green onions. I’m super late I’m sure but I just made this! Amazing 🙃 thanks so much ! So happy you made it! This was amazing!! My new fav sandwich!! Thank you!! Wow that’s great news, thanks Chris! I’ve made this a couple of times now and it’s been great each time. The first time I made it, I thought it tasted almost exactly like potato salad. Hello Angela, does this freeze well? I like to make double batches of recipes and then freeze. Thank you and by the way your hummus recipe is the best! Hey Yola, Oh that’s a great question…I actually have never tried freezing it before! Sorry about that. I would suggest freezing just a small portion as a test (just so you don’t ruin a whole batch). I’d love to hear how it goes! Oh. My. Word. This sandwich is my absolute favorite of all time! 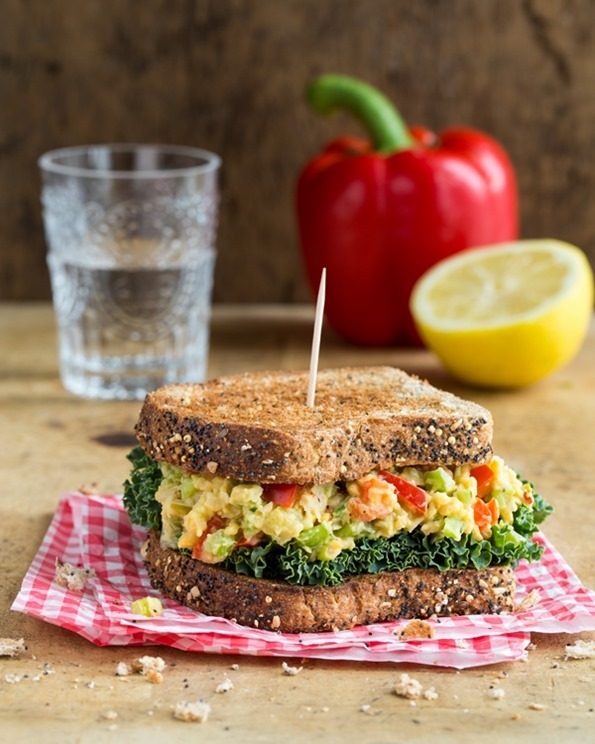 I’ve had other chick pea salad sandwiches and this one beats them all! I used dijon mustard instead of yellow. I was crazy on love right away but did not expect how much better it was the next day!!!! I’m so glad I made extra! It didn’t make to see another day! Made this and loved it! Left out the red pepper and garlic but was still great. I have served this over lettuce , as well as, on sprouted toasted bread. Will become a staple. this is my first experience making this particular recipe. I have been on a pretty ~ close ~ to ~ vegan diet for about 8 months this was/is the easiest, most delicious recipe I’ve tried so far. I used a pastry cutter to mash the chickpeas, because the gaps in my potato masher are way to wide to be effective. The cutter did the job very quickly & left enough decent sized junks to make an interesting texture. I see many yummylunches from this recipe in my future. Hey Paula, Oh I love the idea of using a pastry cutter for the chickpeas….GENIUS!! So happy you loved it. Thank you for your review! I just made this! So delicious! Even my non-vegan husband loved it. Will be making this often. I tired this even before I had to cut out dairy and its DELISH! I had not eaten mayo in years so I was a little nervous about how the vegan mayo would taste but it was great. I did add a little more lemon juice and added red pepper to spice it up a bit. Now that I have had to cut out dairy in the life this is a PERFECT salad for summer and to get me over the hump of …”WHAT CAN I EAT that doesn’t have dairy in it” question. THANK YOU SO MUCH! Aww I’m so happy to read your glowing review Ryan :) Thanks so much! To say this is the most amazing recipe I have ever tried would be an understatement. Hey Dana, I haven’t tried it before, so I’m not sure. I would suggest freezing a tiny portion and testing it out. I’d love to hear how it goes! Anyone know how long this would keep? Made mine and I’m loving it! I think I’m using smaller servings at a time, and I’d hate for it to go to waste, but I’ve got it in an air tight jar. Hey there, It will keep in an airtight container in the fridge for 3-5 days. Hope this helps! I have had the ingredients for this in my pantry for a while, but hesitated. Chicken salad is my favorite. Nothing can replace a good chicken salad. I’m also not a huge fan of chickpeas. They are mealy, so unless they are in hummus, I’m usually not a fan. O.M.G. I’m converted. This is amazing! I was licking the spoon as I made it. Now I want to try it with all my favorite chicken salad additions: apples and pecans, pineapple and walnuts; grapes. I want to stuff it into tomatoes. This is going into my lunch keeper file. Thank you so much! Thanks Amy, so happy to hear you loved it! I think your additions would be so good. Made this for lunch for my non-vegan friends using homemade mayo, they loved it! Thanks! So glad to hear that Isabelle! Thanks for your review. So glad you love the chickpea salad! It’s such an energizing recipe. I never write reviews, but I had to take a moment to tell you that this recipe was fantastic. Best chickpea salad recipe I’ve had and love the fact that so many veggies are included. Thanks! Oh wow, this was so so good. I realized after I started that I didn’t have any green onions or red pepper (how does that happen! ), but it was still amazing. Thanks for a great recipe! Thanks Sheileen! I’m so glad to hear that you still loved it without the onion and pepper. :) I’ve found it to be a pretty versatile recipe! I love this!!! It is so amazing. I don’t like red bell peppers so I didn’t add it but it was still very enjoyable. The dill pickle added a nice acidic flare along with the lemon juice. Great recipe. I will definitely make it again! I have made this at least 10 times now and it’s amazing. I follow the recipe pretty much exactly and it turns out perfectly every time. I thought the recipe in another app looked familiar. They use the same photo. Hmmm. They did substitute greek yogurt for mayo…. Hi CJ, Thanks for letting me know! I have reached out to them to inquire. This was DELICIOUS!! I am new to plant-based eating, and was looking for easy lunch options for work. This recipe is AWESOME!! Thanks so much Sarah!! I’m so happy you love it as much as we do. I can’t get tired of it! Hi! Super excited to try this recipe! How long will it last in the fridge? I’m hoping to make it for lunches this week! I love this sandwich! It looks so good and super easy to make. I have been looking for a good recipe like this. Cannot wait to try it!